When Adam and I steal an opportunity to dash off by ourselves – leaving the kids with my parents– we usually find our way to some sort of hiking trail. As we’re either climbing up the rocks or cascading down the slope, I like to place my foot in the exact footprint that Adam just left behind. Then I don’t have to think. He’s still standing so I should be fine. We can now freely carry on a conversation because I’m not worrying about my next step. When I read this passage , fear almost reverberates within me. Couple that with the realization that I cannot hide my true feelings and heart from Him. My wrestling with this truth lies completely bare before the Lord. I can do nothing to even dress it up. Now, it’s not a fear that I’ve done something wrong and have severe consequences awaiting, but rather a, knee-bending, will surrendering, face-down, I-CANNOT-DO-THIS reverent fear. To think of walking in the steps of Jesus is scary. 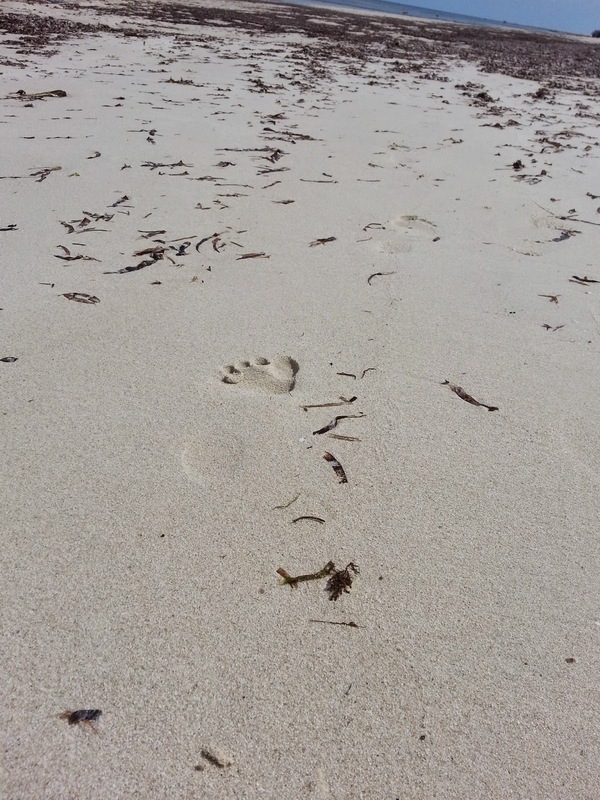 “Whoever claims to live in Him must walk as Jesus did.” Jesus left footprints behind for us to follow in. Sometimes they are scarcely seen. Sometimes they lead up precarious rock mountains requiring training and “gear”, or maybe they lead through a slippery wet valley… dark, damp and dangerous. Other times those footsteps lead up to a doorstep of someone we’d rather ignore, lead to a letter that’s painful to write, a conversation preferably left unsaid, or to a person we’ve left unforgiven. Jesus went to the SINNERS of this world to give them HOPE and a FUTURE of VICTORY. To walk in THOSE steps challenges every morsel of my being; it divides my flesh and cuts right to my soul. We see Jesus wrestling with those feelings as He walked this earth in flesh. He prayed in the garden for this cup to pass over Him. That maybe there would be another way. His Father must want Him to be Happy right? Just take this from me! He pleaded, he grieved, He cried drops of blood. Then He surrendered. He knew the cross was the only way. He’d gone over the plans many times. The Plan was drawn up and signed before the foundation of the world. He chose to yield and accepted His lot to walk in the steps of the Father’s Plan. It’s because of those steps that I, WE can also follow in His steps. Jesus’ perfect atoning sacrifice means I boldly come into God’s throne room and ask for help to walk this Hill of Difficulty or Valley of Humiliation. I cannot walk it alone – and I don’t have to! Are you ready or willing to be ready to walk in His steps?